Crowne Plaza Melbourne’s culinary team with Fareshare CEO, Katherine Gokavi-Whaley. Guests checking in to Crowne Plaza Melbourne are being asked to donate 50 cents as part of their booking to help feed disadvantaged locals in a new charitable drive by the newly-refurbished hotel. Crowne Plaza Melbourne has joined forces with Fareshare – which works with the Feed Melbourne Appeal in one of Australia’s largest charity kitchens – and will donate 40,000 meals in an effort to reach a grand total of 100,000 meals. Over the course of 2018, Fareshare is aiming to generate enough funds to cover two-million meals. 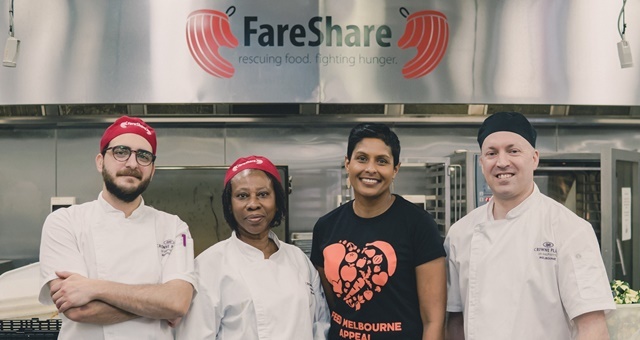 Fareshare works with hotels and other hospitality businesses to ‘rescue’ surplus food which would otherwise go to waste, using it to prepare free meals for more than 105,000 Victorians in the local community each month. Thousands more are turned away due to lack of resources. As part of the drive, donations can also be made at one of the hotel’s restaurants – Clarendon St Grill or Lobby Bar – or at check-out. Hotel Head Chef, Warren Finger, said his culinary team had been assisting further by volunteering time each fortnight to work in the Fareshare kitchen preparing meals. IHG Are Manager, David Mansfield, said corporate partnerships such as this was a great way to help tackle rising poverty rates in a meaningful way.